Geräumige Wohnung mit drei Schlafzimmern an der Sonnenküste von Florida. Die Einheit wurde vor kurzem mit King-Size-Schlafzimmer-Set, Edelstahl-Geräten, einem 50-Zoll-HDTV mit erweiterten digitalen Kabel, saubere weiße Küchenschränke mit Blick auf das Meer durch den Balkon aktualisiert. Die Unterkunft befindet sich auf der obersten Etage des Gebäudes und hat den größten Grundriss im Gebäude. Das Gebäude verfügt über einen beheizten Pool, Jacuzzi, Tennisplätze sowie Liegestühle und Tische und Liegestühle. Die Schlafzimmer haben ein Kingsize-Bett, eine Königin und zwei Einzelbetten. Einfach nur wunderschöne Fliesen zum Wohnzimmer / Esszimmer, und alles durch das Haus, und es gibt ein schönes Wohnzimmer. Auch die zweite Badezimmerdusche wurde umgebaut. Auch hinzugefügt schöne Jalousien für die Privatsphäre. Ausstattung: Privater Balkon mit Gartenmöbeln, Blick auf den Pool und den Golf von Mexiko. Gerät kommt mit Waschmaschine / Trockner, Farb-TV (Kabel), Icemaker, Geschirrspüler, Entsorgung, Wet-Bar, außen Gasgrill und Kinderschaukel. We were really impressed with this property. It was exactly as advertised- well maintained, had everything we needed both inside and out. My only complaint (and this is something the owner has no control over, I realize) is that the rules around hot tub use were completely disregarded by several guests who allowed their toddlers in the spa. At times, the parents were in the deck chairs and the toddlers were "alone" in the spa. I'd go so far as to say the little kids were monopolizing it, which I think was quite inappropriate. Again, no fault of the owners so nothing anyone could do, and overall our stay was wonderful. Even on some cold days, it was lovely just to sit inside and see the beautiful views. I give this place 5 stars! I am glad you had a great time. Thank you for the kind words. We had a fantastic stay! 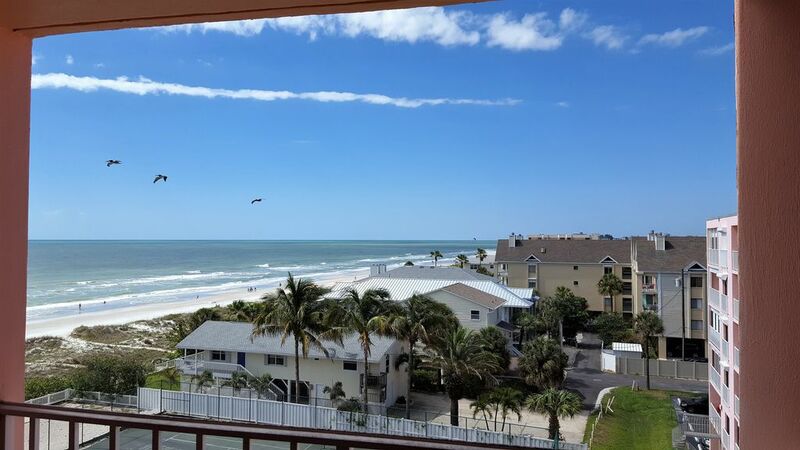 The condo is very clean, spacious and has amazing views of the gulf! We were very comfortable and all agree that it was our best family vacation, ever! I am glad that you had a great time. I just had several upgrades completed in the unit including new sofa, carpet installed on the balcony and new quilt. The condo is very clean and spacious. We had a great time and everything was just as it was described when i booked. I liked that our assigned parking space was right next to the elevator and we didn’t have to worry about getting rained on when we would leave and come back. Very family oriented complex and we would like to return again someday. Thank you for the nice review. I agree that the Reef Club is a great place for a family vacation. I am glad you and your family had a great time. I have tried to create a functional uncluttered living space for everyone that comes to stay at my place. I think you really get it. The backdrop of my unit is like a setting for the guests to sit back and enjoy all that a beach vacation has to offer. And most importantly to spend time with each other and enjoy time together with those you love. Regards. James M. Allen, the owner. I had been at the Reef Club before. This condo (as it says in the description) is much bigger than the other one. It was just perfect. I went with my kids and grand kids and we had a great time. The place has everything you need, it is clean and very very comfortable. The only thing that I would change (and it has to do with the building and not the condo), is that I would put the trash cans downstairs in another location. The reason for this is that, even thought they are kind of in the logical place, with the weather as hot as it was, the trash was rotting and the smell as you got out of the elevators was pretty bad. But like I said that has to do with the building and not with the condo. The condo is perfect. The condo was nice, clean and bigger than I expected. Beautiful view from the balcony. We had a great time on our vacation. The condo was nice and spacious. The property manager was very nice and available if needed. We will definitely use this condo in the future. Great ocean view. I am the owner of this property and I always find something new that I enjoy each time I visit. I always leave with a complete feeling of rest and peacefulness. I have posted additional pictures for your review. The Check in time is after 300 pm and check out is before 1000am. You are assigned one parking space (505) . You must remove all garbage before departure. You shall place all dirty dishes in the dishwasher (power off) before departure. The wireless internet is included and you have HD cable television for your enjoyment. During High Demand weeks bookings are Saturday to Saturday only.